Who better to take the top spot than Godzilla himself? Ishiro Honda's Godzilla is the real deal, one of the single most important films ever made in this niche cinema genre, and simply one of the greatest films of all time. 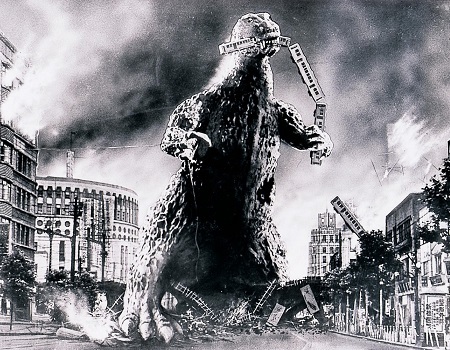 While credit has to go to King Kong for being the progenitor of the entire "giant monster movie" tradition, Godzilla deserves all the laurels it gets for electing to put a stuntman in a rubber suit over using stop-motion animation, giving its central monster a new vitality. Plus, Ishiro Honda's film still hits like a hammer even today. Forget that you're watching a grown man in a monster costume stomping on crude miniature cities; this is a picture crafted to reflect a nation's grief and fear over the atomic bombings of Hiroshima and Nagasaki nine years prior. Honda's film is intentionally modeled to echo the horror of that joint event, and yet it blends that allegory with pure spectacle and entertainment to create something awe-inspiring and even artful.